I have procrastinated, for more reasons than I know to explain. But the short answer is this: As I stepped into the waters of writing a study of the condition of the feminine heart and the truth of scripture, I found myself severely lacking. And even that is my own perception. The truth is, even this procrastination has stemmed from my struggle of wanting to be worthy of being chosen. I have let fear cripple me, hold me in chains, keep me from moving forward. I fear that no one will approve what I say. I fear that no one will confirm that I am a writer, that I am not wasting my time. I have led myself to a mountain of expectations that I cannot possibly climb. I expect myself to be able to speak only the truth of scripture as I look at Peter's life. I expect to move past assumptions and questions and tell you only what is true and accurate and flawless. But, I am not a scholar. I have a thousand times more questions than answers. And so, I have hidden from this series, from you because I have been afraid that I would not be able to maintain a standard worthy of being chosen. Now, I will write about Peter, about how I see myself in him. I will not dissect the original language. I may offer more questions than answers. But, this is how we learn. Questions. If we do not ask, we will not discover. Through the Gospels, Peter is called a few different things: Simon Bar Jonah, Simon Peter, Peter-the rock, Satan. The last one seems a bit harsh, doesn't it? So many names, one might get confused as to their true identity. Peter must have wondered who he was. "Am I silly ridiculous Simon, son of a silly little dove(I learned a while back that Jonah means silly little dove) ?" "Am I a rock, worthy of the church being built on?" "Am I working for the enemy of my Teacher?" When Jesus first meets Simon Bar Jonah, he renames him. Before Simon speaks a word, he is given a new name and a destiny. He says to Simon, "You are Simon, the son of John. But you will be called Cephas-which translates Peter". What strikes me most in this exchange is the timing. Jesus did not wait for Peter to obey. In fact, Jesus had not even extended the invitation (or command) to follow him. So, then, is this how it works? Before we even begin to walk with Jesus, we are given our new name? I think so. But, it's also important to recognize that Jesus wasn't giving Simon Peter this new name based on who SP was but rather on who he would become. Let's sit with that for a while. In Christ, we have been given a new identity and destiny. And I would venture to say that most of us are not yet walking in our new name. But, it was not given to us based on who we are today. It is who we will become. It is who our Maker created us to be. 1. What are the names you have been called by over the years? 2. 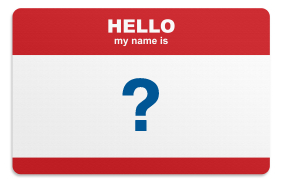 Have you been given a glimpse of your new name? Care to share? Let me start. It's only fair, right, that if I am asking you to comment, that I also answer my own questions for you? 1) So some names I've been called: Erin-the name my parents gave me. Erynn-the way I spelled it for a couple of years in college. Erbear-a nickname from a friend. Seth's little sister-this was not my favorite. I love my brother but didn't want to be defined by him. The vacuum-my softball nickname. I've also allowed myself to be named "the singer" "the lonely" "the onverweight""that christian girl" ...all of these names, the silly nicknames, the self-given names, the unspoken names, have at one time ruled my perception of my identity. 2) Sometimes I think I catch a glimpse of my new name but I also am quick to question if it's from God or from myself. I want the name He has chosen for me, not one that I think would be good to have. So I am still listening and watching for this new name. "I fear no one will confirm I am a writer"... Uhh, ya. The club- joineth it. Names I've been called: J-Red, J-Rod, Big Red, Red Dog, J-Dog, J-Luck, J-Lizzle, Luck, Jare, Deraj, Ja Reed, Jamie's brother, and Jerry (by about 1,000 people I didn't bother to correct). As a kid I was called Cabbage Patch or Shamu's Daughter. While I laugh at those things now I remember it hurting so bad that my desire to not be called that became an idol for a long time. I still feel guilty every time I put food in my mouth before I've worked out. It's almost daily that I have to say out loud the words from Isaiah "you are precious in my sight and I love you". 1). My parents call me Mindy or "Mondo", my sisters call me sis;-) Was known in high school as "Little Misty" since I was and still am Misty's little sister;-) I was ok with that since I idolized her growing up. Sadly, I was also frequently called "zit face" "chicken legs" and "four eyes" among some other harsh names. Now, praise God, I am called Mommy by two amazing kiddos, beloved daughter by God, and by many "the singer". His Songbird (gave to me this past February 2011) and then Red Warrior (given to me May 2011). So I take the wounds from the past names and know that they have strengthened the warrior within me! Gentle as a Songbird, fierce as a warrior. Thanks so much for sharing! I think that is a very common struggle among women. And how sad that the enemy has cause so many of us to doubt our worth in Christ and to feel guilt over enjoying the blessings of God. And I think you make a great point. Our desire to avoid being called by certain identities can so easily become idols. I wonder if Peter spent more time than necessary trying to make sure he was never again referred to as Satan. I am so glad you joined in! How exciting that you have been told your new names by God. That is awesome. I pray that you walk confidently in them and that they become even more clear through the years.